All files are pdfs unless otherwise noted. Report appendices are available upon request. Email cecohen@brandeis.edu for more information. This report outlines the activities of the minor in Creativity, the Arts and Social Transformation (CAST) in its third year, fall 2016–spring 2017. A second section focuses on the activities of the Program in Peacebuilding and the Arts. From classes, design labs, research projects, and performance pieces, CAST students and faculty were engaged and productive in exploring connections between the arts and social transformation. The minor in creativity, the arts and social transformation (CAST) and the Program in Peacebuilding and the Arts were very productive in 2015-16. On campus, through the CAST class and events, many different perspectives on the arts and social transformation were brought into conversation. Beyond Brandeis, several research projects, publication opportunities and outreach initiatives have raised the profile of the discipline of peacebuilding and the arts and extended the international network of scholars in the field. 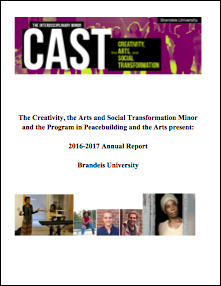 This report outlines the activities of the creativity, the arts, and social transformation (CAST) minor in the 2014-15 academic year. The first sections describe the development of the minor; the support staff; the recruitment efforts; and the opportunities CAST provided faculty and students in its first year. The next section describes the inaugural Introduction to CAST course, covering the assignments and general activities of the class. The final section provides information about the first CAST graduates and how they were formally recognized.